Sorry, it's been a long while since I've had the time to catch up on my mountainous backlog of articles, but here's one to tide you over. 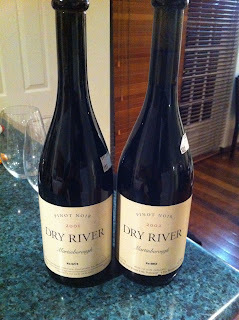 I've had these two bottles of Dry River Pinot Noir sitting in my cellar for many years. You know how it is? You have a prize bottle(s) of wine, and want to drink it, but want to wait for that special occasion that befits the quality of the wine, but it never seems to be the right time. And it's even worse when those bottles happen to be rare like the proverbial hen's teeth, and even worse when you have a vertical collection that really needs to be drunk at the same time, to appreciate the nuances between the vintages. But then, you can't drink it alone, or even with another person, because there's more wine than can be sensibly drunk and still appreciated. Thus it was with my 2001 and 2002 vintages of the Dry River Pinot Noir, hailed by some as the best New Zealand pinot, and one of the best in the world. Well, I got tired of waiting in vain, so I dropped my standards and quietly resolved to crack them open at the first remotely appropriate opportunity, since the perfect opportunity might not come by before the wines went downhill, not because they're not made to last (because they are), but because I may not have looked after them properly (speaking of which, I drank a 1985 Moss Wood Pinot Noir with good mate Ben (aka Harry Potter to some) the other day, and it was still superb, but that's another story). So when my best mate Brandon and Ben, both of whom are red wine aficionados, popped over last week for a bit of a catch-up, I pounced on the opportunity. In my fridge, I discovered the perfect accompaniment to pinot - a chunk of foie gras, which I had purchased from La Parisienne Pates (290 Lygon Street, Carlton, Victoria) when I was in Melbourne the week before. 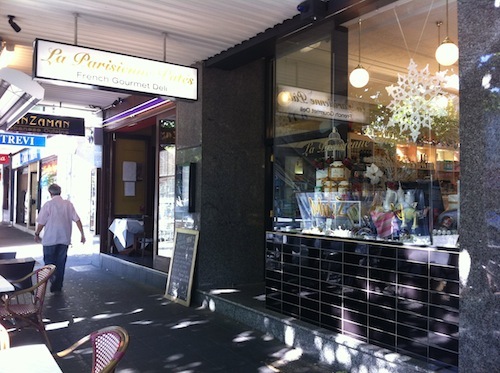 An aside: La Parisienne Pates has the most delightful array of pates and terrines. But even better, it sells foie gras in all shapes and sizes. You can buy it in a tin, but why bother when it's also available as an entire lobe? In my case, I opted for a slightly more sensible $26 vacuum wrapped chunk about the size of my fist, which was enough for 3 generous, thick servings. I gave them a quick fry on each side on high heat, just enough to develop a thin layer of toasty crust; and served them up accompanied by fresh crusty bread from Lawley's Bakery at (where else?) 562 Beaufort Street, Mount Lawley, Western Australia. Yes I know I am supposed to feel bad about how the foie gras was made, but it tastes sooo good - the light crispy texture of the fried surface giving way to an unbelievably thick, creamy and rich mouthful, whose taste can only be described as "foie gras". Anyway, back to the wines. 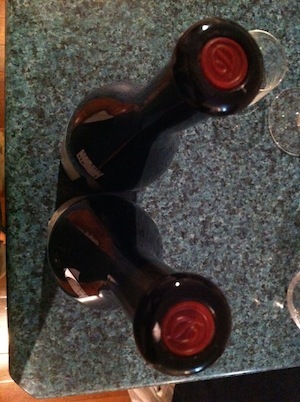 Both bottles were in fantastic condition, and with my two pronged butler's friend, I didn't need to roll the dice with the structural integrity of the corks - I managed to extract them with the wax seal intact! We decided to drink both at the same time in order to have the best opportunity to compare them. Amazingly, it was a case of apples and oranges! The 2001 was like your traditional powerful antipodean pinot noir - a nose of leathery, earthy forest floor; a first taste of woody, leathery, mushroomy and savoury flavours with hints of blackcurrant slipping through the forest like a wil' o' wisp; heavy velvet in the mouth. Harry reckons there was tobacco as well, and I think he's right. Despite its age, it still had a strong tannic structure which ended with a dry finish that lingered long after the wine had been swallowed, leaving behind a gift of ephemeral vanilla. We all agreed that it was a little bit challenging at the start (we forgot to decant ...) but as the wine breathed in our glasses, it gradually loosened up and became a lot more approachable. The 2002, on the other hand, was a completely different kettle of fish. A light, fragrant pinot noir perfume greeted the nose, faintly reminiscent of a Vosne Romanee I enjoyed years ago. So delightful that I could have just kept sniffing away for another good 10 minutes, but I got thirsty. My sip was followed by fresh, citrus flavours of redcurrants with blueberry sweetness, with a zippy yet full mouthfeel. It too finished dry, but in a different way, with a fresh tartness that wasn't present in the 2001. Both wines still felt like they could have developed in the bottle for many more years, with strong, lively but not overpowering tannins, nicely balanced against the cornucopia of flavours that delighted, and at times challenged, the nose and palate.